The Good haircut always provides a positive vibe. The attitude will be visualized in your body texture. So, why not have a decent haircut? Frankly speaking, Haircut shows your professionalism and determines the behavior and the way of living life. It looks simple, but it is beyond imagination. In order to do so, you need to use the best hair cutting scissors. So, in this post, we will be discussing the best professional hair shears. Shearguru is one of the elegant scissor that will thrive your modern hair cutting style. This scissor is made of Japanese steel – one of the best steels in the world. Therefore, it doesn’t decay shortly. Once, you bought this scissor; it will work consistently for the lifetime. 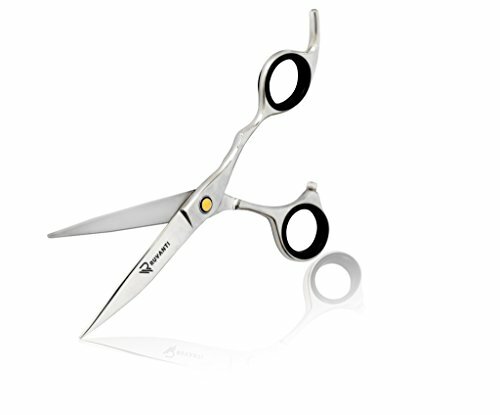 Handling this shear provides the sleek look. Most of the shear lock up the hair during cutting at the particular time. It causes some pain. Meanwhile, to cut hair without any pain, shearguru might be the best preference. It is possible only due to its design. The blade of this shear is honed to a fine degree. The screw attached to the shear, in addition, will provide a result beyond an expectation. Hence, without locking up any hair, it will help in cutting hair smoothly. It will hence provide the professional experience for the barber. The grip added in this shear is one of the best features, I have noted. It helps to use the shear for the longer time by eliminating tiredness. By comfortability, grip, and blade, this shear might be the genuine choice for cutting any hair. 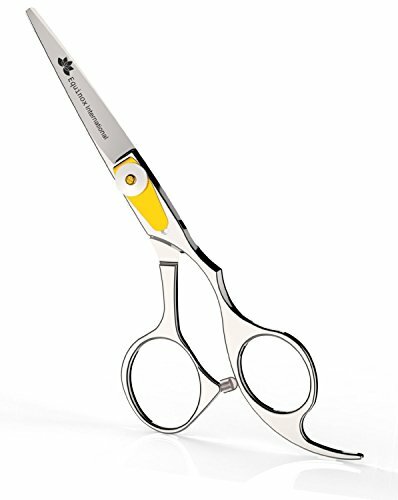 One of the stylish look scissor which is lightweight and more comfortable to use in daily life. It can be used for home as well as for the professional purpose. 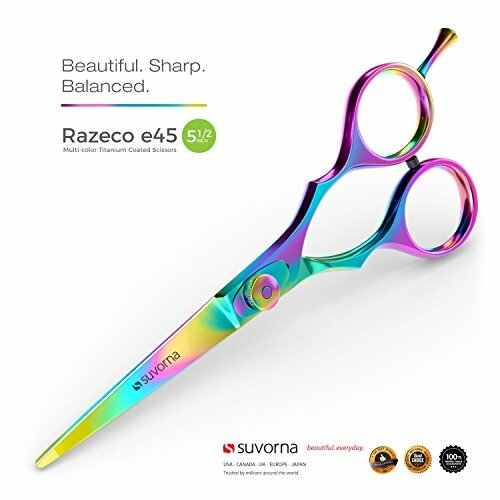 For the most precise cutting of hair, you can choose suvorna razeco. Talking about its shape, it has a convex edge which allows cutting hair more perfectly. The knob is adjusted at the intersection. For the fine tuning of the knob, the backing plate is also maintained. Hence, both the blade of the scissor is adjusted with the help of the knob. The blade is extremely sharp which is definitely stainless steel. On the top of that, it is made of Japanese steel. It is heated continuously until it becomes rock hard. Hence, the durability of the blade remains for the more protracted period. Furthermore, multicolor remain the unique feature of this scissor. At the first phase, the coloration of the scissor is completed by hand. In the second place, titanium is coated into it to provide the stunning look. 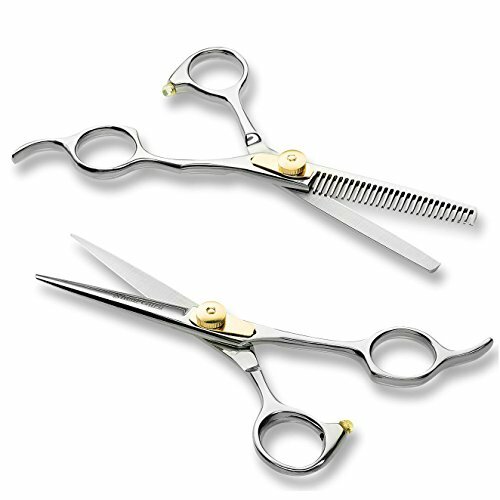 For any scissor to work with more absolute precision, it must have greater grip. Equinox is best for its grip. The ergonomic design makes it possible. The adjustment located in the middle of a scissor helps to manage the tension. It, therefore, helps to cut the hair with much more comfortability. What it does is manage the shear to adjust it at your hand? As a result, you will not experience exhaust even using the shear for a longer time. Furthermore, the shear is made of noble Japanese steel. Thus, the question regarding its durability won’t arise. Although — how better it cuts hair — might comes into the surface. The haircut will be purely dope implementing this shear. The most serrated blade when moved comes in contact with hair. As a consequence, it will tear apart the hair. The advantage of capitalizing this shear is, it doesn’t pluck the hair instead it cuts it off. This shear is preferable for anyone including men, women, and children. 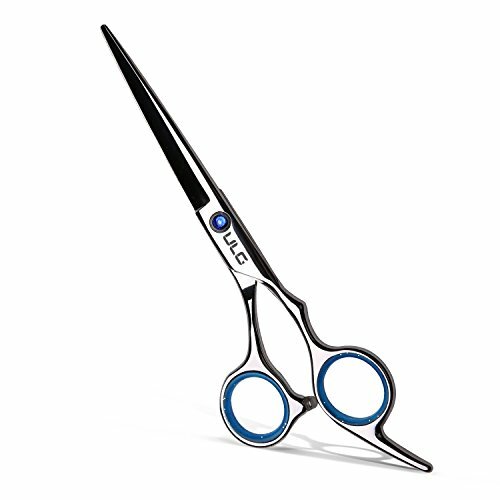 The eloquent looking scissor with the most impressive design is ULG hairdressing scissors. Indecent diamond attached at the intersection of shear increases its charm. It is fully polished with silver color. The charming looks make it attractable to use at any time. Talking about its blade, it is a stainless, hypoallergenic made from Japanese steel. The trimming of hair will be easy and more sophisticated. The blade will immediately cut the hair once it comes in contact with the hair. Rather than plucking or pulling the hair from the head, it will cut it off. It is the must-have specialty of any shear. The grip is even more secure. You can easily insert your finger into the shear and cut it with much more easiness. You will get 2 rubber handle along with this shear. One gets damaged – you can use another. The rubber handle provides more flexibility to use the shear. The highlighted feature of this shear is its blade. The overall length of this shear is 6.5 inches where the cutting blade comprises of 2.5 inches. Hence, it will cut the dense hair with just one stroke. If you need a convenient storage to put the scissor, Utopia might remain the best choice. A leather package comes along with this scissor. You can easily put the scissors into the zippered storage after being used. Thus, it might prevent unnecessary damages. A durability of the scissor remains prevalent when you preserve it safely. More so often, blades are made of only stainless steel. Alternatively, utopia uses stainless Japanese steel which is more durable than other steel. The blades are honed to the perfect degree. 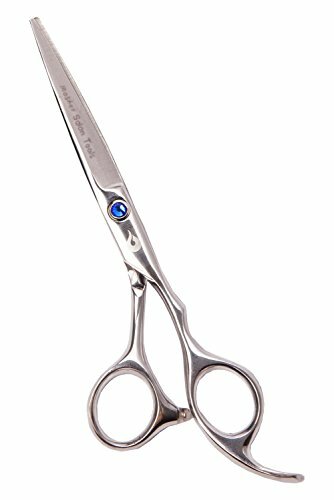 6.5 inches scissor with 2.5 inches blade helps to cut the hair in a mean way. The ergonomically designed scissor is easy to hold. The excellent grip at the handle resists from the exhausts. Furthermore, the perfect haircut aids the mark of the best scissors. Hence, an exotic comfortability will be achieved using this scissor. 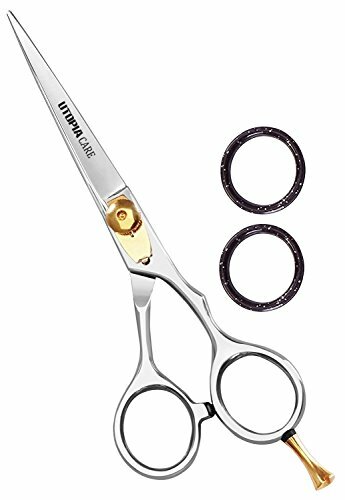 The scissor with a standard price, more durability, impeccable cut, and the best design might be nonother than Utopia car hairdresser scissors. If you want to fade your hair rather than cutting it thinner, professional hair cutting scissor might be your most ideal choice. Due to the razor sharp edges, it fades the hair more genuinely. It captures even the small hair and cuts it to provide white fade for the contemporary look. The scissor is made from Japanese steel as other best scissor. Thus, trimming hair and durability might not be the problem. It lasts the lifetime. Hence, you won’t need to buy any other razor once you bought this scissor. The ergonomic grip is also the eminent feature of this scissor. The easy to hold scissor can be used for more professional work. You can work consistently without having a strain at your hand or elbow. 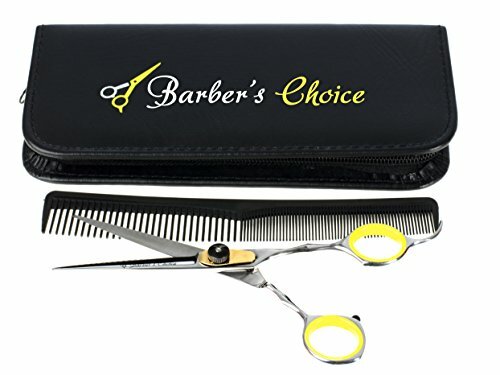 You will get an extra comb and storage to store the scissors. Note: It can be used for both professional and home purpose. You must be careful while trimming the hair. A normal scissor might damage the hair tip. As a result, it will end up splitting the hair. The hair looks nasty with a split at its end. On this account, the sharp-edged blade with the best precision must be employed while cutting it off. 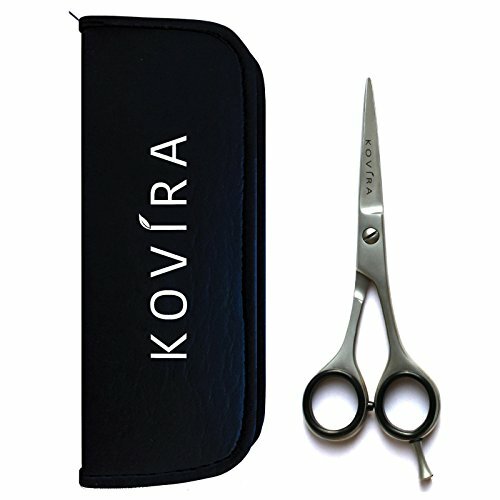 In regard to this, kovira is a 6.5 inches scissor with the sharpest blade helps to cut the hair soothingly. The easy to grasp end and the longer blade considers this the suitable scissor to cut any kind of hair. The rubber attachment helps to grab the scissors without any impact on hand. It will, therefore, provide easiness to trim the hair for a longer time. Furthermore, the knob adjusted to the scissor maintains the tension. You can tighten or loosen it to maintain the friction between the blades. Hence, it will prevent unwanted cuts. If you want to go open a barber shop, chiulan must be your first preference. Because the shear set comes with the most affordable price plus most advanced cutting elements. The package includes a comb, hair thinning scissors, hair cutting scissors, and many more. 6 inches shear has an extremely sharpened blade. The convex end is sharpened by hand. Thus, the sharpness of a blade lasts longer than any other scissors. The sharpening isn’t the solution to cut hair with most comfortability. It must provide a precise cut. The critical focus of this shear is its precision and reliability. Hence, using this shear, guaranteed precision will be achieved. About its grip, it is 100% flexible. Due to the ergonomic design, you can easily hold the scissor with your finger resulting to cradle you finger more efficiently. 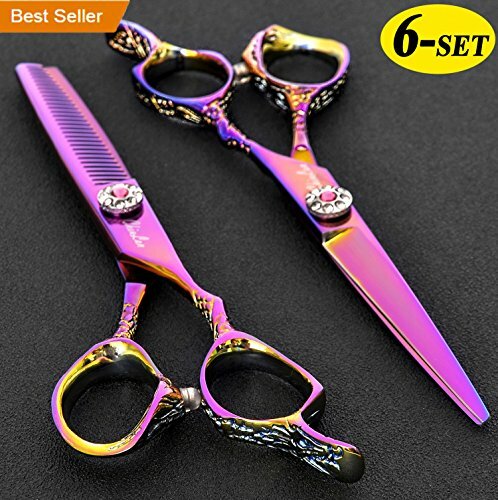 Therefore, using this scissor will provide the best haircut in limited time. The colorful shear has tension adjustment in the middle. You can adjust the movement of the shear by maintaining the knob at the intersection. The intentionally best hair shear for the barber is Ruvanti Professional Hair shear. Just 4.2 ounces shear is easy to lift and cuts the hair consistently. Taking advantage of this shear, the pressure will not be at your thumb or your hand. Hence, You won’t experience fatigue even using the shear for a longer time. 6.6′ inches Japanese steel in overall length with 2.6 inches blade cuts the hair with much easiness. Even the brittle hair comes in contact while cutting your hair. Thus for routine use, it will provide a maximum comfort and smooth cutting experience. The unique feature of this shear is the ball located at the middle of the scissors. It works as the tension adjustment. It means you can easily manage the tension between blades using this ball. The ball is painted in golden color. Lastly, the grip constitutes super integral part of any scissor. It determines the best quality of scissors. The soft grip added in this scissor makes you confident to cut any hair. Thus, it stands as number nine on our list. Last but not the least, Mosher salon tool is at number ten on our list. Do you use scissor while traveling? If yes then, the mosher salon might be the best tool to carry. The leather zipper case comes along with this scissor plays a vital role while relaying it. You can place it into the bag which will prevent from cuts. It will, in addition, preserve the sharpness of the blade. The ergonomic design makes this tool to be used forever. After using the shear for longer there will be kinda of fatigue. Isn’t it? You won’t feel fatigue here because you can cut the hair by resting your fingers upon the molded handle. The shear with perfect size is easy to carry and lift with your fingers. As soon as you cradle your finger, it cuts the hair with perfect precision. It is possible due to it’s sharpened Japanese blade. Buying this shear makes you 100% satisfied. The haircut will be lengthened using an unsharpened blade. The hair tip might split on the course of handling a defected blade. Hence, the sharpened and most durable blade must be looked before buying it. If it is possible, purchase a stainless steel blade which is hand sharpened. Markedly, you can look at a blade made of Japanese steel. Precision is what you will need while cutting the hair. Does it look more pleasurable with a nasty haircut? It doesn’t. Thus, the scissor that cuts the precise amount of hair must be chosen. There are many scissors available on the market. These include hair fade scissor, hair razor scissor, hair cutting scissors. Hence, you must wisely choose the type of scissor you wanted to buy. Only the scissor with the perfect grip must be chosen. It will assist you relief your hand from the exhaust. The grip decreases the amount of pressure occurred at your finger by distributing it at the scissors. The tension adjustment helps to maintain the movement of the blade. Once you tighten the knob, the blade will move steadily. Otherwise, it depends on the knob adjusted by you. It prevents the unnecessary cut. Thus, the knob is the point to consider before buying any scissors. To sum it up, shearguru is one of the best professional hair shear in our list. It comprehends all the features needed to be in the best shear. The grip included in this shear is extremely soft. The blade is extremely sharp and is based on ergonomic design. It doesn’t mean all other scissor are useless. They stand equally as important as shearguru. Yet the features and its price vary accordingly. Altogether the reviews we have included are totally based on its price, features and its comfortability. If you have any queries regarding this post, feel free to contact us.